LinkedIn today announced it has partnered with some of the biggest names in online education to help users include educational accomplishments that go beyond the traditional institutions. As part of a new pilot program called Direct-to-Profile Certifications, users can now add certifications and courses to their profiles. The pilot features “premier” online education firms, of which LinkedIn lists seven that it has partnered with: Coursera, EdX, Lynda.com, Pearson, Skillsoft, Udacity, and Udemy. The company wouldn’t share if it plans to expand this list if the pilot is successful, but even if it doesn’t, it looks like the professional social network has its bases largely covered. Here’s how it works. 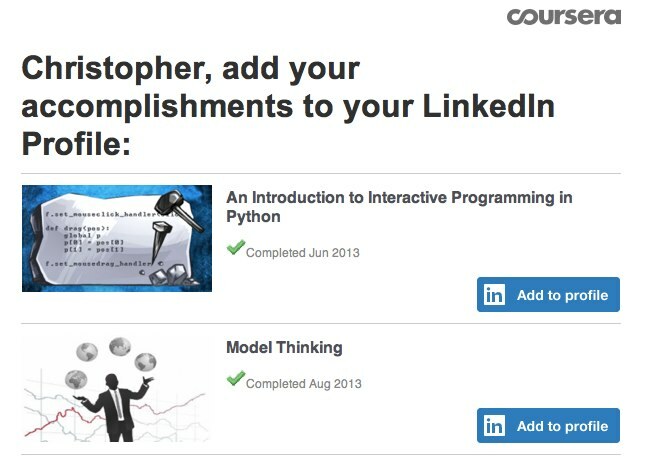 Once you complete a course with a participating provider, you will receive an email from LinkedIn that includes a link with an automatically populated certification field. Yet this doesn’t end at online education firms; LinkedIn says this is its “first step” in making it easier for users to keep their professional profile updated. We can thus expect that the company will be partnering with other providers of courses and classes.